Morning everyone – and Happy Mother’s Day!!! My mum is lucky enough to be sunning it up in Dubai! Lucky thing, so I am spending this beautiful day shopping this morning, then we’re off to Jordan’s Mum’s for dinner, so it’s not all that bad. So onto the post…. I thought I’d give you a brief review on my relatively small selection of highlighters I have (I am hoping to grow this). 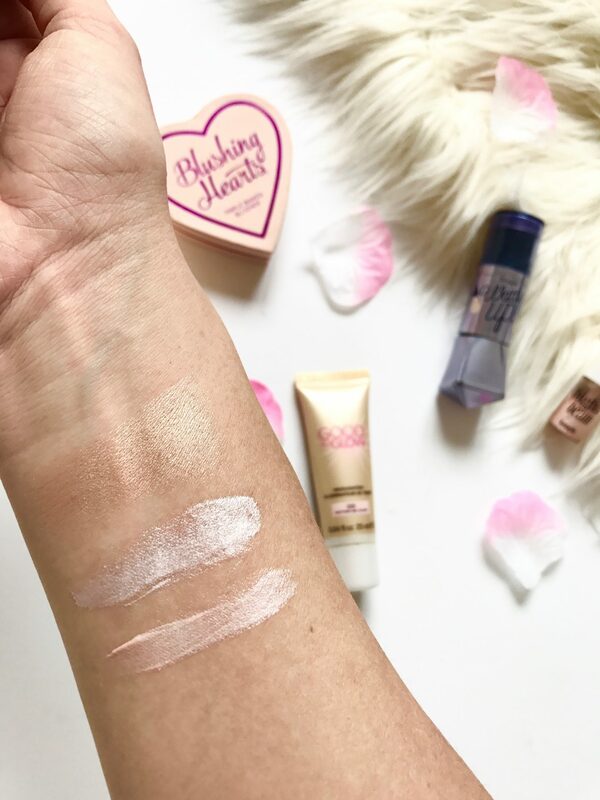 I am going to be rating them and also provide you with swatches, and I would love to know what you all think of these highlighters if you’ve tried them, or if not some other recommendations would be fab! Top of the swatch is the Benefit Watts Up highlighter. As you can see this has more of a golden (champagne) tint to it compared to the other swatches. I know this is quite a pricey highlighter, however it is pretty good. It was my favourite for a while, until I discovered another cheaper one (wait for it). I quite like the way you apply this highlighter, and Benefit does make it easier for you. It literally comes in like stick format with a sponge on the other side for you to blend with. You don’t need a lot of thus product for you to shine, so it lasts quite a while. So this is the middle swatch, and I think I picked this up after I left my whole make up bag round a friends house (who lives ah hour away) so I just needed something cheap to cover me whilst I waited for my make up bag. Now, if I’m honest, I really wasn’t impressed with this at all. It just didn’t seem to do anything and as soon as the product was on the face it disappeared and smudged the rest of the base. It didn’t give me that ‘glow’ I was after, even though it looked like a good product straight out of the tube, just not on your face. I definitely won’t be buying this again. As you can tell, the one I have isn’t the full sized one, I think I picked this up in a gift set I bought a while ago. This one has a slightly rosy tint to it as you will see from the swatches. This is quite a nice product, however it isn’t my favourite. Once you dot and blend the highlighter on the cheek bona, you can see quite a good glow, but I’d say it was quit subtle, rather than a ‘WOW! look at that highlighter kind of look’. 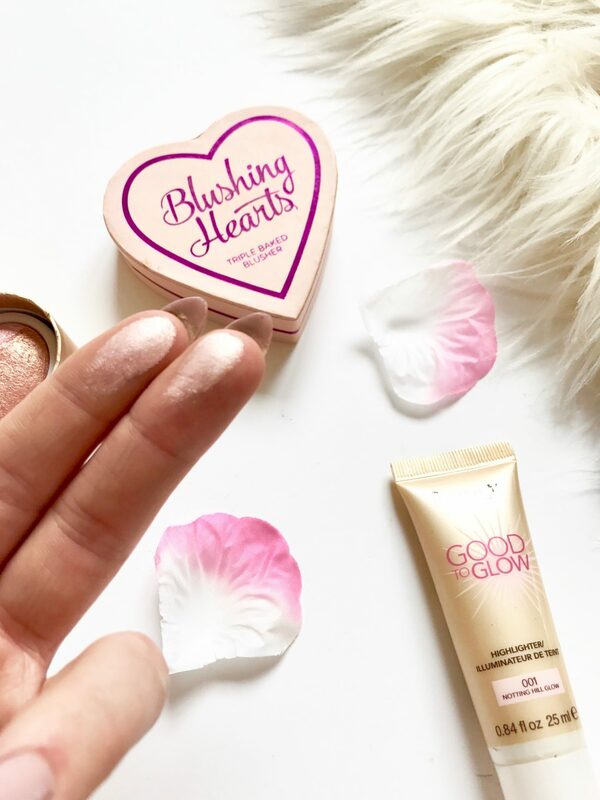 If you are looking to achieve quite a natural glow, then this is probably the kind of highlighter you need, but if I’m honest the price puts me off buying this one again. You have probably already seen me and a hundred other people raving about this product. It is just amazing, and definitely gives you that amazing glow. As you can see from the swatch I done, just by dipping my two fingers into the product left me so much product and look at the shine!! This is by far my favourite highlighter at the moment, and they do a range of shades, some more pinky than others, so its worth having a look. I wear this every day to work, and even after a stressful day, this is still glowing, even when I might not be!! So, as you can probably tell I actually prefer powder based highlighters as apposed to liquid based. I think this is because, for me, they are easier to apply and just seem more durable. What are your thought on these products? Do you have any you can recommend? I definitely prefer a powder highlighter. I have never got on with the liquid ones. I can never get a good balance. The triple baked one is so pretty! Lovely post, loved the photos! I’ve used hi beam for ages but the blushing hearts one looks really lovely. I’ll have to have a look for that one! ?